Exchange server is an email collaboration network system or sometimes called mail server, calendaring software that runs on the Windows server environment. Exchange server services and permissions are handled by Active Directory, which controls all the services of the server to be carried out properly. The Active Directory provides all mailbox database information, address list services, and other recipient-related information. In this article we will discuss about Exchange Server 2003 Active Directory. On the Exchange server 2003 the configuration information was also kept in the Active directory. The Directory is managed by System Attendant component on the Exchange server 2003. The System Attendant holds various internal components like DSAccess and DSProxy. These internal components communicate with the cache directory information and Active Directory to boost up the speed through which directory information has to be getting back and to reduce the burden on the domain controllers and global catalog servers respectively. The DSproxy is used to allows communication between Active Directory and Exchange 2003 computers. Domain Controllers Vs Global Catalog Servers: The global catalog server is always equivalent to domain controller but the vice versa is not true always. 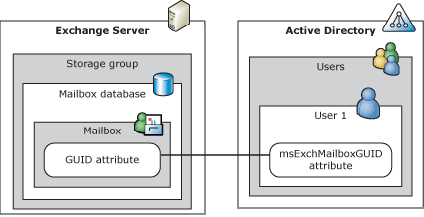 Exchange Server 2003 Active Directory Service Access Component: The internal component of System attendant component i.e. DSAccess statically or dynamically finds directory service servers in your organization. SMTP Categorizer: The SMTP categorizer should communicate with the Active directory to solve the user or recipient data information and message restrictions. The categorizer comes under the DSAccess which uses its own mechanism to get in touch with the Active Directory. Recipient Update Information: Recipient objects such as mailbox data are updated through directory servers in which Exchange server 2003 takes part to communicate with it. Active Directory driver is the core component of the Microsoft Exchange server that grants permissions like to create, modify, delete and query for the AD DS (Active Directory Domain Services) data to Exchange services. Active directory all access in Exchange server 2013 is done by the Active Directory driver. The DSAccess provides directory lookup services including components like message transfer agent (MTA), SMTP and the Exchange store. The Active Directory driver also uses MS Exchange Server 2003 Active Directory topology (MSExchangeADTopology), which allows the driver to use DSAccess (Directory Service Access) topology data. Here the word topology means there is an interconnection of network to share information through network systems. The DSAccess topology data holds the list of available domain controllers and Exchange server request is handled by global catalog servers.